Don’t need one of my full service packages? Just need a little help getting things in order? 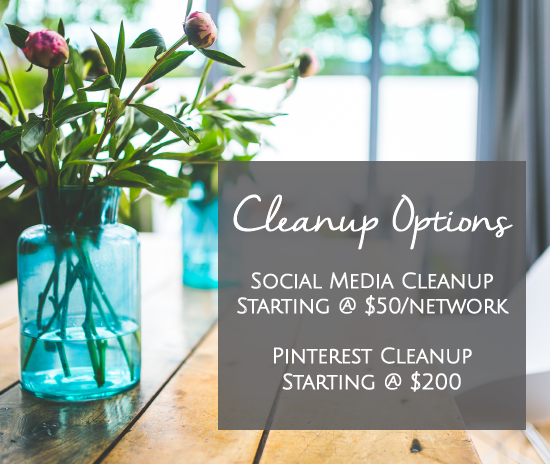 Try one of my cleanup options! Amy has been a great addition to my team. Her understanding of social media has brought my businesses to a new level of networking. Amy is easy to work with, conscientious, timely and good with her word. I seriously do not know what I would do without her! I have recently started to work with Amy as part of my blog team. She is taking over a lot of the content sharing and social media outreach that I didn't have time for. She has been amazing so far! Great ideas, responsive to my requests, diligent, and fun. I highly recommend working with her! Amy was a great help in crossing off a big item on my to-do list-- cleaning up my Pinterest boards. She reorganized my boards, chose color-coordinated pins for the covers, and updated keywords and descriptions. The best part is she got it done so quickly. Thanks to Amy, my to-do list just got a lot shorter and less intimidating! I had my consult with Amy H. today and she is... a powerhouse of knowledge! I have yet to start my business and had a bunch of questions about using social media, privacy settings, maintaining control over my content, utilizing analytics and more. At this point I feel I am more prepared to step forward into utilizing the knowledge Amy so graciously shared. "Thank you" hardly seems adequate. Amy, you ROCK! THANK YOU!!!! !